Since Enterprise Architecture became more prominent, it’s been somewhat a relationship of love and hate with the business. It does help the company to find its way through organizing business strategy, the processes it defines and the technological capabilities which underlie them, but the way it was executed in a not so long past made business executives, for lack of a better word, skeptical. Why should they? 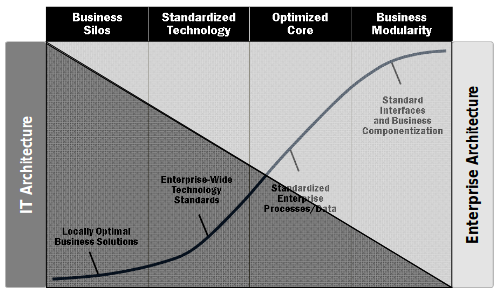 In most definitions of Enterprise Architecture found in the specialized literature, it is about the mapping of the entire enterprise capabilities, from the business imperatives, strategies, processes and people, down to the applications that support the business and the data by which it is represented, finally relating to the underlying technology infrastructure. More than that, it should assure that it is able to support the business and its model currently and in the future by providing a project-oriented, continuously-improving manner to assess its current state and evolve it as time and needs change. As I used to joke about, “in a perfect world, a fully deployed Enterprise Architecture practice should allow the company to assess the impact in local revenue of a misplaced Ethernet cable”. Enterprise Architects should be at the forefront of a company’s decision making process, directly reporting to CEOs as advisors and being “secret weapons” for company growth. Once tightly aligned to the business, IT should be able to provide all that is needed to guarantee current operational stability and the fulfillment of future business demands. So why is it not as common as it should be? Business leaders grew aware of the fact that Enterprise Architecture can easily turn from a value-creating practice into a documentation burden if not well directed and made active from the start. This is not without some grain of reason. A significant amount of literature and conceptualization around Enterprise Architecture by some of the most popular frameworks (TOGAF, Zachman, FEAF and others) stresses about the importance of creating a solid understanding of the relationships between business elements within the company and its underlying technology and provide encompassing, methodologically sane documentation about it (the well-known City Planningapproach). However, when it comes down to “make it happen”, showing its bottom-line value to the business, its practical aspects are treated vaguely and, maybe for being too concerned about not being forcefully prescriptive about its format and way of adoption, it lacks some direction towards actionable best practices. Traditional Enterprise Architecture approaches also have the reputation of being too conservative and reactive. Lots of its responsibilities are directed towards the elaboration and governance of the main standards for the creation of new capabilities within the company, normally from the application, data and technology perspectives. The avoidance of prescriptiveness towards the adoption format, here, contrasts with the rigidity it proposes to apply to the technology adoption process as a whole. This normally places Enterprise Architects in the position of gatekeepers of the business-to-technology approaching principles and methods, which means that every new project has to be validated against those standards. While, if carefully managed, it fosters capability reuse and avoids the construction of IT silos, it may as well as slow down the innovation pace to a level unacceptable by the business. Also, a worrying number of architectural efforts and projects are directed towards the architecture itself, its documentation and communication plans. This may make Enterprise Architecture seem like an “autistic” practice, without connection with the real world of the business, and sometimes even of the IT organization. With that said, for Enterprise Architecture to be more engaged in the process of value creation, it has to leave its position of passiveness and take a more proactive stand towards business. It must encompass much more than plain old “City Planning”; cities which are “too planned” lose their ability to grow and adapt along the way. It has to be agile. “So from the business side, there’s often a deep resentment at what’s perceived as the know-it-all arrogance of IT, and its apparent inability to deliver what the business believes it needs; and from the IT side, there’s often deep frustration that business ‘just doesn’t get it’, either in expectations or awareness of possibilities. It’s not a happy mix. However, in the Digital Transformation era, IT is not just a means to realize business imperatives and models which are conceived separately from the technology, and whose role and duty is just to “be aligned with the business” in a struggle to prove its worth. New digital technologies such as mobile devices, Internet of Things, Cloud Computing, Machine Learning and Big Data, as well as methods of turning application deployment faster such as Agile frameworks like Scrum or Kanban, Continuous Delivery/Deployment and DevOps, established a whole new ground for the importance of IT for how the business model itself is built. Success in the Enterprise Architecture endeavor, now, depends, of course, on the business acumen of its main practitioners, but also on the awareness of the architect about which and how new technological possibilities may be inserted in the new business models. While C-Level executives have been constantly pushed into accepting that the current state of affairs in the marketplace is changing to digital ─ and some, even most of them, have honestly committed to transforming their mindsets ─ they may lack the tech awareness or depth to absorb all the potential offered to the business by these new trends. Now Enterprise Architects have the responsibility not only for being reactive to executive strategic decision or to apply governance processes to the development of new capabilities, but also to be proactive in helping these executives to formulate new directions given the plethora of possibilities in a fast-moving way. That means that Enterprise Architects have a lot more at stake when participating in strategic decision making. Just as the market changes rapidly, the underlying architecture ─ business and technological capabilities ─ should have the ability not only to provide flexibility for the new undertakings, but rest itself on a methodology that allows for its own quick review and evolution. More than that, fast-moving business systems should have their decision making as free as possible from rigid governance hindrances and quarter-long approval and follow-up processes. One of the main attributions of modern Enterprise Architecture is to be a steward and enabler of business and IT capabilities evolution. More than just establish a cycle of long-term architecture transformation, establish the agile practices for it to be able to keep pace with the rhythm of the Digital Transformation. So Cockcroft and Netflix took a bold step and accepted the involved, non-centrally-controlled, almost chaotic nature of its business; as such, it demonstrates a self-organization which, if well driven, feeds its own growth without resorting heavily on a centralized control, fostering the right emergent behaviors — in this case, the creation and deployment of new products and capabilities, as well as their governance — while being able to react promptly to any non-planned hurdles such as architectural exceptions, project delays and resource shortage (the above mentioned externalities) and avoiding the chaos that may arise from such huge, complicated, highly connected environments. Complex systems are networks made of a number of components that interact with each other, typically in a nonlinear fashion. 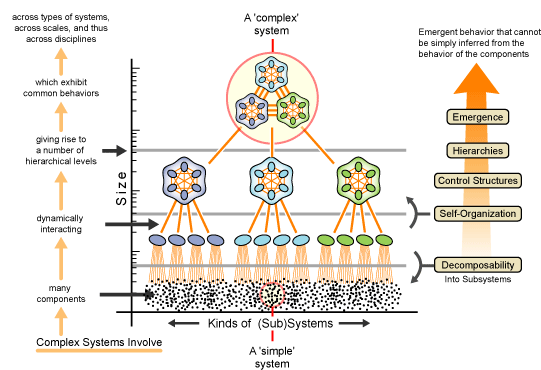 Complex systems may arise and evolve through self-organization, such that they are neither completely regular nor completely random, permitting the development of emergentbehavior at macroscopic scales. Emergence is a nontrivial relationship between the properties of a system at microscopic and macroscopic scales. Macroscopic properties are called emergent when it is hard to explain them simply from microscopic properties. Self-organization is a dynamical process by which a system spontaneously forms nontrivial macroscopic structures and/or behaviors over time. So this is the big takeaway, and a paradox of some sort: for Enterprise Architecture to catch up with the needs of the digital age, and be morerelevant to the business, it has to have a less restrictive and centralized governance proposition in its relationship with the executives and product managers, being instead more of an advisor of the business possibilities of the new technological trends, while providing the right basis for the information systems teams to “follow the flow” in the life cycle of the supporting IT capabilities. And, of course, as products and services are released more often and with less hassle, C-Level executives are happier, and more open to the Enterprise Architect’s advice. So, what does it change for Enterprise Architects? The answer is: everything. Enterprise Architecture’s new duty is to seat at the same table as business executives, joining forces to weave a digital business model together. This demands a more significant knowledge of the business domain from the side of the architects. On the other hand, a new approach to understanding the interplay between information systems and the business has evolved from the ever accelerating need for innovation. Rigidity is out of question, so enterprises and their capabilities should be seen as they really are ─ complex systems where the main raison d’être for Enterprise Architecture is to foster feedback loops and coordinate the stream of the emergent behaviors, letting new capabilities be implemented as they are conceived. As a conclusion, although many digital companies (especially those which were founded as digital businesses, not established firms which underwent transformation) ditch the idea of having a traditional Enterprise Architecture practice altogether, I understand that there is a number of principles and practices from related frameworks that could be utilized and revamped with agile and complex systems perspectives to help in the organization and formulation of a well-structured approach, providing freedom of creativity flow and new capabilities advisory while keeping a healthy level of control, which will be the subject of a forthcoming article. 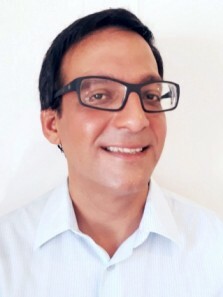 Alessandro F. Martins is a Senior IT Business Strategist with 21 years of experience in IT and business in areas ranging from Enterprise Architecture and Business Process Management to Program and Project Management, C-Level consulting for large companies and advisory for Digital Innovation. : Carlos Maldonado, Nelson Gómez-Cruz: When Management Encounters Complexity. Documentos de Investigación, Escuela de Administración, Universidad del Rosario. : Jason Bloomberg: Is Enterprise Architecture Completely Broken? I Founded a Company That is Growing Fast; Why Would My Board Replace Me?